A team of volunteers from the general public has pored over observations from NASA’s Spitzer Space Telescope and discovered more than 5,000 “bubbles” in the disk of our Milky Way galaxy. Young, hot stars blow the bubbles into surrounding gas and dust, highlighting areas of brand new star formation. 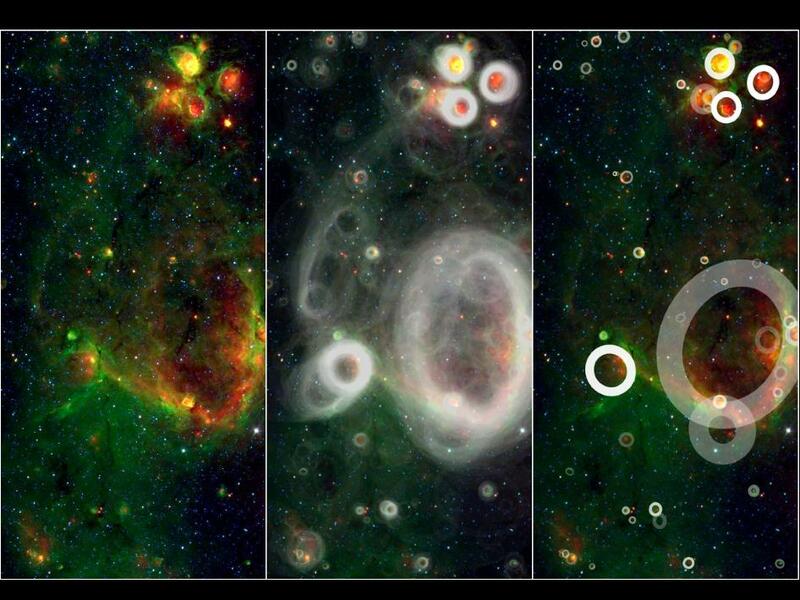 Upwards of 35,000 “citizen scientists” sifted through the Spitzer infrared data as part of the online Milky Way Project to find these telltale bubbles. The users have turned up 10 times as many bubbles as previous surveys so far. Computer programs struggle at identifying the cosmic bubbles. But human eyes and minds do an excellent job of noticing the wispy arcs of partially broken rings and the circles-within-circles of overlapping bubbles. The Milky Way Project taps into the “wisdom of crowds” by requiring that at least five users flag a potential bubble before its inclusion in the new catalog. Volunteers mark any candidate bubbles in the infrared Spitzer images with a sophisticated drawing tool before proceeding to scour another image. “The Milky Way Project is an attempt to take the vast and beautiful data from Spitzer and make extracting the information a fun, online, public endeavor,” said Robert Simpson, a postdoctoral researcher in astronomy at Oxford University, England, principal investigator of the Milky Way Project and lead author of the paper. The data come from the Spitzer Galactic Legacy Infrared Mid-Plane Survey Extraordinaire (GLIMPSE) and Multiband Imaging Photometer for Spitzer Galactic (MIPSGAL) surveys. These datasets cover a narrow, wide strip of the sky measuring 130 degrees wide and just two degrees tall. From a stargazer’s perspective, a two-degree strip is about the width of your index finger held at arm’s length, and your arms opened to the sky span about 130 degrees. The surveys peer through the Milky Way’s disk and right into the galaxy’s heart. Volunteers for the project are shown a small section of Spitzer’s huge infrared Milky Way image (left), which they then scan for cosmic bubbles. Using a sophisticated drawing tool, the volunteers trace the shape and thickness of the bubbles. All the user drawings can be overlaid on top of one another to form a so-called “heat map” (middle). Features that have been identified repeatedly by many different users jump out, revealing the overall pattern of bubbles in this part of the galaxy. At least five volunteers must flag a candidate bubble before it is included in the final catalog (right). The brightness of each bubble in the catalog is determined by its “hit rate,” or the fraction of users who traced it out. The faintest ones were identified by 10 percent of the users, while solid white indicates a hit rate of 50 percent or better. After identifying all apparent bubbles, which can include wispy arcs of partially broken rings and the circles-within-circles of overlapping bubbles, volunteers get another of the 12,263 possible image sections to scrutinize. With so much sky to cover, it is clear why so many volunteers are needed to do this kind of science. This entry was posted in Uncategorized and tagged NASA, stellar birth. Bookmark the permalink.